The Loudmouth Cart Bag 3.0 is here! These amazing cart bags have a built-in putter tube, 14 way top with some of the dividers going all the way down, and many more great features. Made from the highest quality materials, this bag is both durable and stylish. 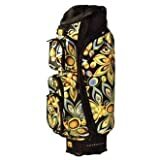 Built-in putter tube, anti-slip rubber feet, 35″ tall, Fits in your trunk, on the bus, or anywhere else you need to take it, Lots of pockets, 14-way top with some of the dividers extending to the bottom of the bag, Comes equipped with a rain hood, a huge pocket for your shoes and equipment, water bottle pocket, a super fancy cooler pocket to keep your beers cold, a pocket for your balls, etc.